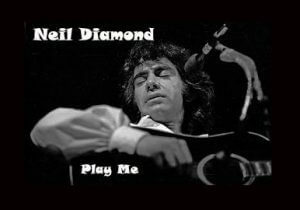 Play me lyrics and melody are one of those all time favourites from the ’70’s by singer songwriter Neil Diamond. The song is particularly favored by women, who have swooned at his concerts and cried out “Play Me, Play Me”. “Play Me” is a 1972 song by Neil Diamond from his album Moods. The song, the first single from Moods, was recorded in February 1972 in Los Angeles. It was released as a single in May 1972 and peaked at #11 in the United States in September of that year. It was listed by Billboard as #27 of his best 30 songs. “Play Me” is a favorite, especially, it seems, among women, who carry signs that read “Neil, Play Me” to his performances and scream “me, me, me” when he plays the tune, described as “an entreaty to romance”. Along with “Love on the Rocks” and “You Don’t Bring Me Flowers”, it is one of the “baritone ballads” that have “60-year-old women erupting in girlish screams”; it makes female audience members shriek and swoon. Some have also suggested that for Neil personally, he was singing about his guitar. To him, his guitar was his companion and source of the tune and he was the source of the words.